Prof. Hyeon K. Park (UNIST Fusion Plasma Research Center)'s team has recently solved the key challenges of fusion plasma. 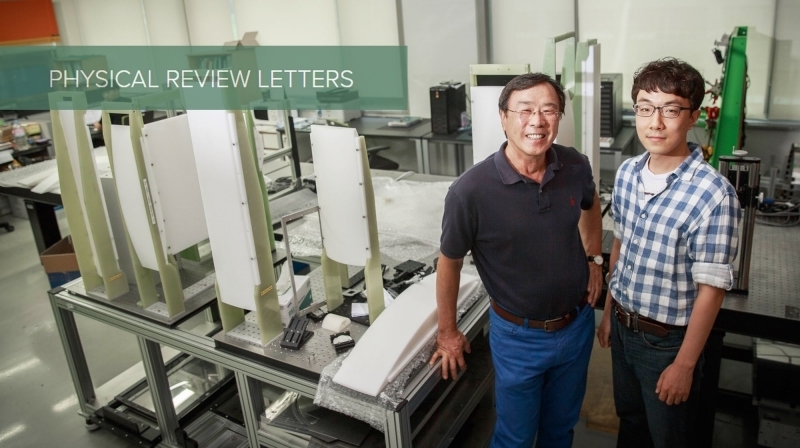 From left are Prof. Park (left) and Dr. Jaehyun Lee, the first author of the study. Prof. Hyeon K. Park's team solves the key challenges of fusion plasma. Experimental result provides new paradigm for the interpretation of ELM-crash suppression. A team of researchers, affiliated with UNIST claims to have made yet another step towards finding a solution to one of the critical but unsolved fusion plasma physics problems, which is to mitigate or suppress the potentially harmful plasma edge instabilities, so-called the Edge Localised Modes (ELMs). The energy bursts caused by the ELMs would be a detrimental event, as it can potentially damage the internal components of the fusion plasma devices like ITER. Therefore, the fundamental understanding of the ELMs and comprehensive physics of the role of magnetic perturbation (MP) as a promising suppression technique have been debated for a long time in fusion community. The research results achieved by the Fusion Plasma Research Center at UNIST and led by Prof. Hyeon Park in collaboration with Prof. Gunsu Yun at POSTECH was published in the August issue of the prestigious journal, Physical Review Letters. Through the study, the research team has discovered underlying physics of the suppression mechanism, in which the swirling turbulent flow driven by MP may prevent the ELM crashes in fusion plasmas. The figure above shows ELM structure in the ELM-crash-suppression phase. Black lines in the ECE image are the reconstructed flux surfaces and the red lines are the separatrix position. 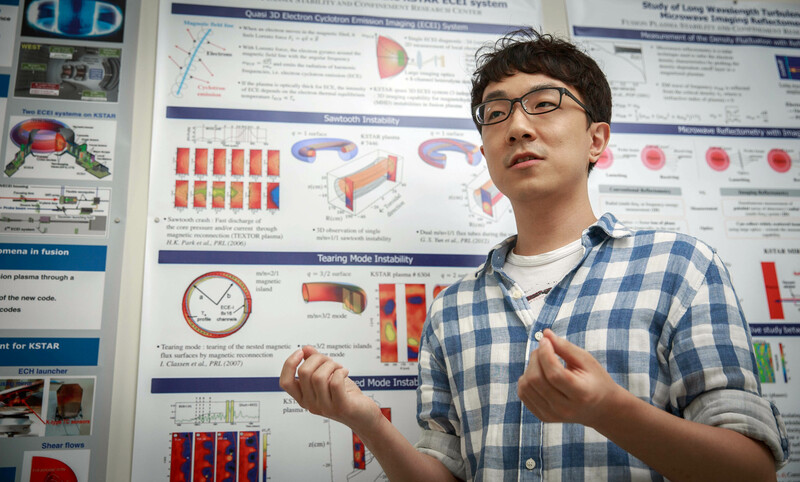 Dr. Jaehyun Lee (UNIST Fusion Plasma Research Center), the first author of the paper has demonstrated that the ELM is weakened by losing energy through interaction with the turbulence induced by MP for the first time. The analysis confirmed coexistence of the ELM and turbulence induced by MP in the ELM-crash suppression phase. The dispersion relation of the turbulence together with spatial structure were directly measured and the nonlinear interaction between the ELM and turbulence was explicitly demonstrated. This research result was possible by the 3D electron cyclotron emission imaging (ECEI) system, pioneered by Prof. Park a decade ago. The most advanced ECEI system has been developed for KSTAR while he was at POSTECH and currently maintained by the UNIST Fusion Plasma Research Center together with the POSTECH team. This research was supported by National R&D Program through the National Research Foundation of Korea (NRF) funded by the Ministry of Science, ICT and Future Planning. 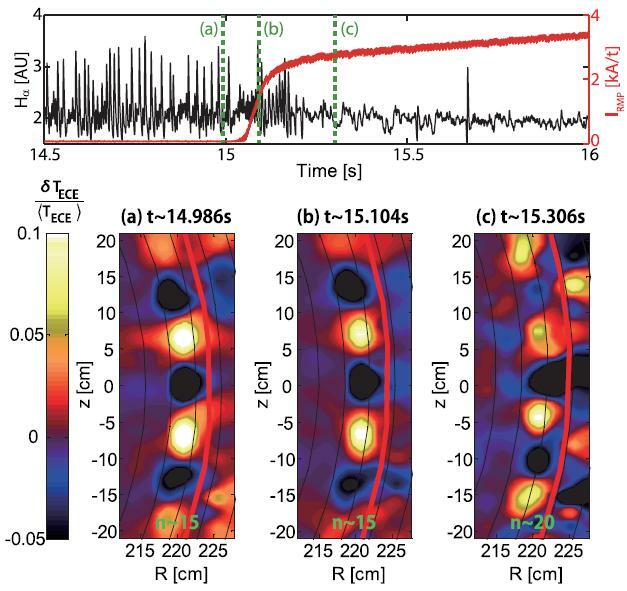 Jaehyun Lee, Gunsu S. Yun, Minjun J. Choi, Jae-Min Kwon, Young-Mu Jeon, Woochang Lee, Neville C. Luhmann, Jr., and Hyeon K. Park, “Nonlinear interaction of edge-localized modes and turbulent eddies in toroidal plasma under n=1 magnetic perturbation,” Phys. Rev. Lett., 117, 075001 (2016).